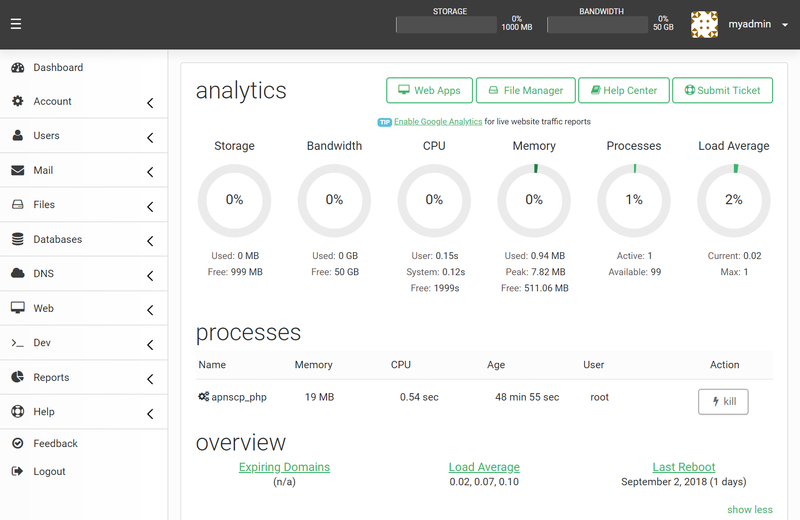 apnscp is the perfect hosting platform for your PHP, Ruby, Node, Python, and Go projects. 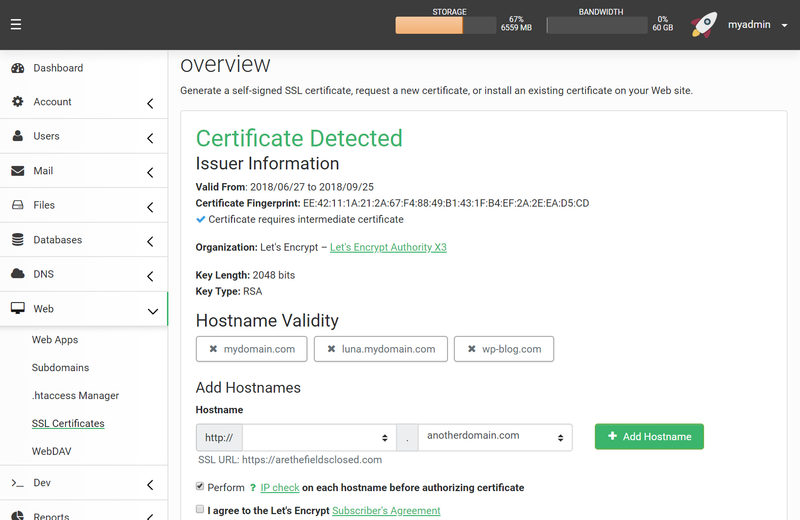 Enable SSL with 1-click, automatically update webapps, scan for OS anomalies, receive notification of service defects, block threats real-time, and keep your site operating at peak performance. Hosting is easy with apnscp. apnscp v3 licenses now on sale. 3.1 in the pipeline! Rolling changelog. Speed matters, which is why apnscp is built with meticulous consideration for all components. On average apnscp's backend can process over 13,000 privileged commands per second. Privilege escalation through careful API calls to its backend is just one way security comes first. Each account gets its own individual control panel separate from the master. 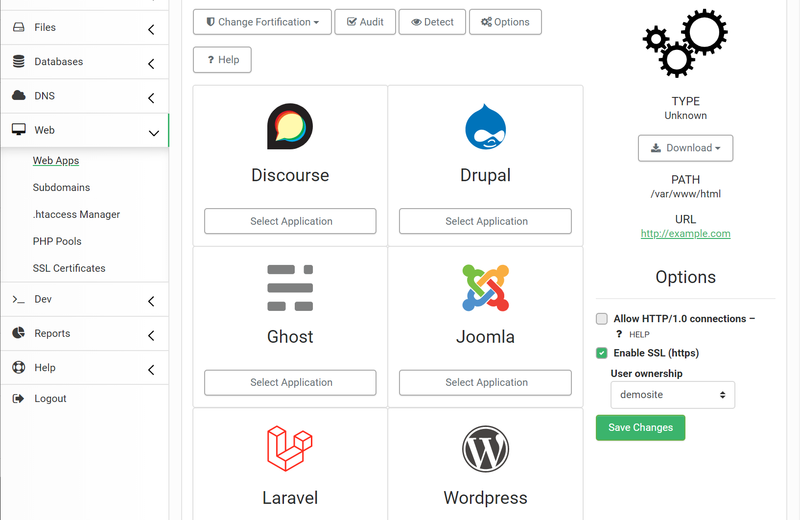 Effortlessly setup and automatically update Wordpress, Joomla, Drupal, Ghost, Laravel, Magento, and Discourse from within apnscp. Setup SSL + create restricted write-only profiles for PHP applications with Fortification. A separate appliance panel is provided for the primary account holder to login and manage sites. One-click setup + renewal of Let's Encrypt SSL. Take advantage of HTTP/2 with easy, free SSL sponsored by Let's Encrypt. Add, delete, and edit your sites from a single point. You can even login to each of these accounts from Nexus. 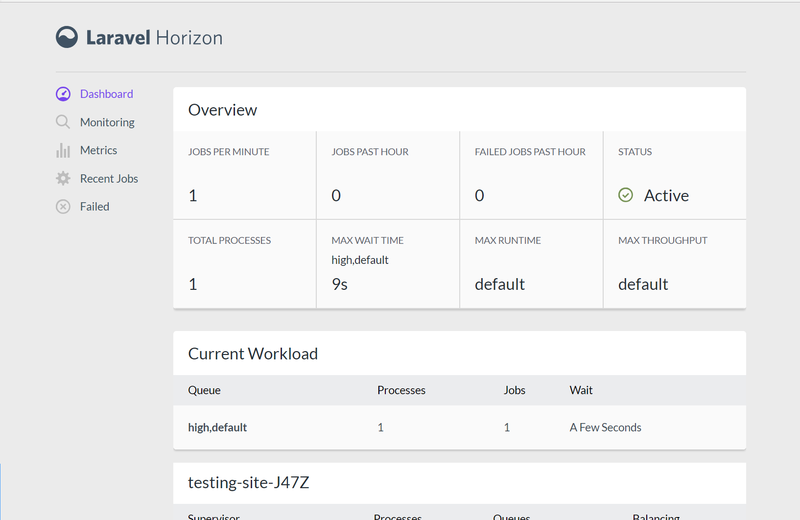 apnscp includes Laravel Horizon, a powerful task scheduler, that allows itself to carry out routine tasks on your server. 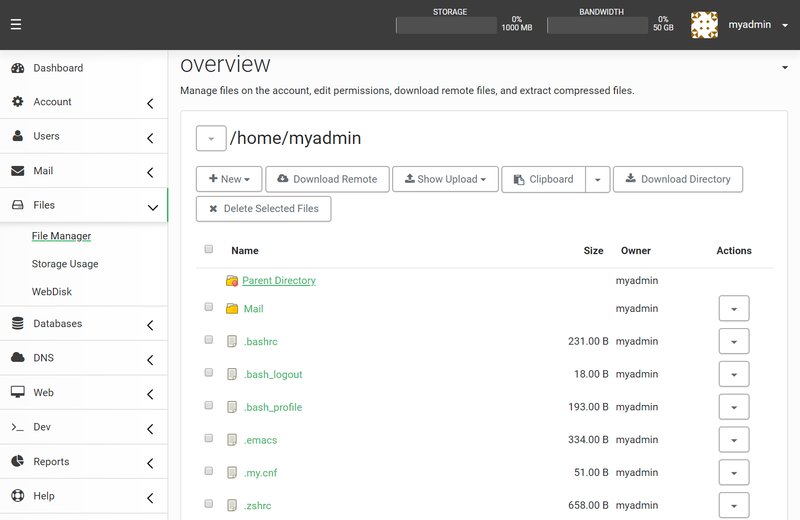 Manage your files in a pinch with apnscp. Upload, download, change permissions, do it all from within the panel or use its integrated WebDAV support if you desire. Scopes reduce complex tasks into simple one-line commands with error checking. Smarthost, brute-force limits, hostname, and more. apnscp automates everything on your server. Automation can be run multiple times to easily detect and correct changes on your server. apnscp updates WordPress, Drupal, Ghost, Discourse, and Laravel whenever new updates are available. apnscp automatically deploys updates upon release, including WordPress plugins and themes. apnscp monitors all services for irregular activity and blocks these threats before they do harm. apnscp monitors both inbound and outbound mail from the server looking for potentially malicious mail. Copy and paste on a new CentOS server from any major cloud provider and you're off! Use apnscp's Bootstrapper to automatically personalize your server. Most servers complete Bootstrapper optimization in one hour. Zero-configuration – sit back and relax while apnscp automatically configures your server. Bootstrapper checks system integrity and can be run again and again to detect and correct only changes in your system. Use AWS, CloudFlare, DigitalOcean, Linode, and Vultr DNS for any or all of your sites. Configuration is a click of the mouse and an API key. apnscp will automatically manage DNS for you. Different sites can use different DNS providers. The choice is yours. Need DNS for a provider not listed? Just use an example module to guide you! apnscp comes with Argos, the perfect decentralized monitoring solution. Argos monitors and repairs your server. If it detects a fault it sends a message to your phone. Spend more time traveling and less time worrying. apnscp ships with a reflected API that exposes over 2,000 commands. Achieve everything within the panel from outside the panel – or just use Beacon, a CLI API companion. apnscp is multi-tenant. Multi-tenancy allows you to host multiple sites managed by multiple users with isolation and resource containment for each account. apnscp is built for real-world hosting, which is under constant threat from hackers. apnscp integrates rate-limited dynamic blacklists and permanent recidivism for persistent threats. Everything works best with more memory, but apnscp is designed to run proficiently on 2 GB platforms by minimizing auxiliary processes and exploiting modern software. Upstream caching is built into the web server. Just send the requisite "cache-control" headers and let the web server accelerate your content improving WordPress throughput by 24x. apnscp utilizes Ansible playbooks to provide a powerful, consistent, and intuitive provisioning process. Once provisioned, apnscp takes over. apnscp includes an easy-to-use unassisted migration tool. Use a supported DNS provider and apnscp will migrate your accounts between platforms with zero downtime. apnscp works with RHEL and CentOS, with 10 year support lifecycles. Ubuntu LTS-based products only provide 5 years of ongoing support. 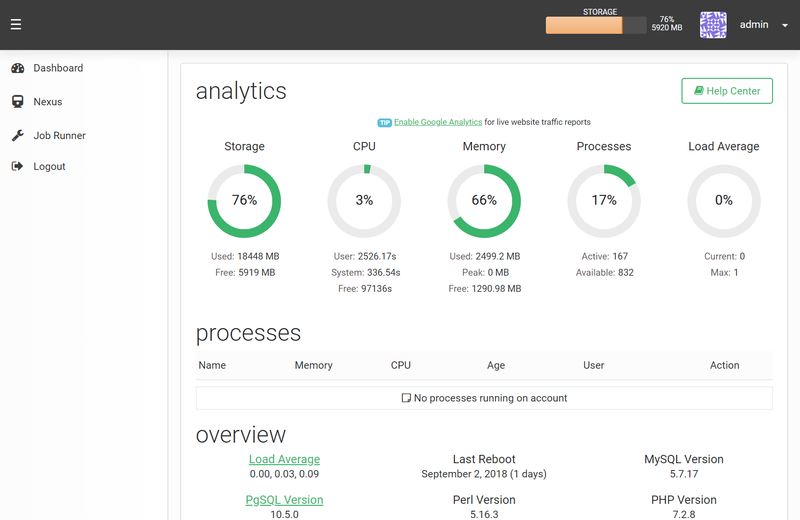 apnscp works great with Linode, DigitalOcean, Cloudflare, and more. Declare your DNS provider, set the API key, and that's it. Full DNS management within apnscp. Users may roll out any version of Ruby, Python, Node, and Go within their account. Each version is private to their account. Limit resources per-account using control groups, built into apnscp. Restrict memory consumption, assign CPU priority, and limit process counts. Customization makes any product great. You can customize the panel internals up to the theme and even the apps. apnscp playbooks are idempotent ensuring that it can be run multiple times to detect service anomalies. Munged something? Just run the playbook. Argos is a collection of monitoring patterns developed over 16 years in hosting. Travel without worry. It fixes what it can and only alerts you during extremes. Quickly set the panel into headless to block external access. Fret not! Every command in the panel is reflected from terminal with cpcmd. Licenses are priced per server. Host as many domains as resources permit. No restrictions on usage. apnscp is on sale for $129 per lifetime license to commemorate 3.0. Prices go up to $249 lifetime once 3.1 is released this Summer. How many sites can apnscp host? There is diminishing marginal return with larger servers. Caches must be larger to accommodate increase data, which is counterintuitive to an efficient cache. PHP and MySQL especially suffer from retrograde performance as cache requirements grow beyond 1 GB. More sites draw more attacks; it's not uncommon for a server hosting 250 sites to block over 2,500 IPs a day. Hardware fails. Avoid single points of failure by distributing clients across multiple servers. apnscp provides monthly server summaries to help you administrate. We recommend no more than 100 accounts on a 16 GB server to provide an elastic buffer for traffic surges. Whatever memory is not used for processing is used by the kernel for caching. Apache is used to provide comprehensive compatibility and protection. For example, Nginx has no comparable inherited rewrite facility that is used to dynamically redirect a variety of subdomain tiers unique to apnscp. Apache's Event MPM operates similar to Nginx's event loop and in benchmarks is about 2 milliseconds slower. A web site's chokepoint therefore is not the web server, but how congested a server is from external threats. apnscp bundles an enhanced mod_evasive module that blocks abusive IPs across all virtual servers. Nginx has a similar component but lacks granular control found with apnscp's mod_evasive release. Support is separated into free community-driven and paid support. All licenses include 1 free bronze support request/year. Community support includes forums and chat. It is the best way to get support in a public setting that benefits everyone else who might have a similar concern. 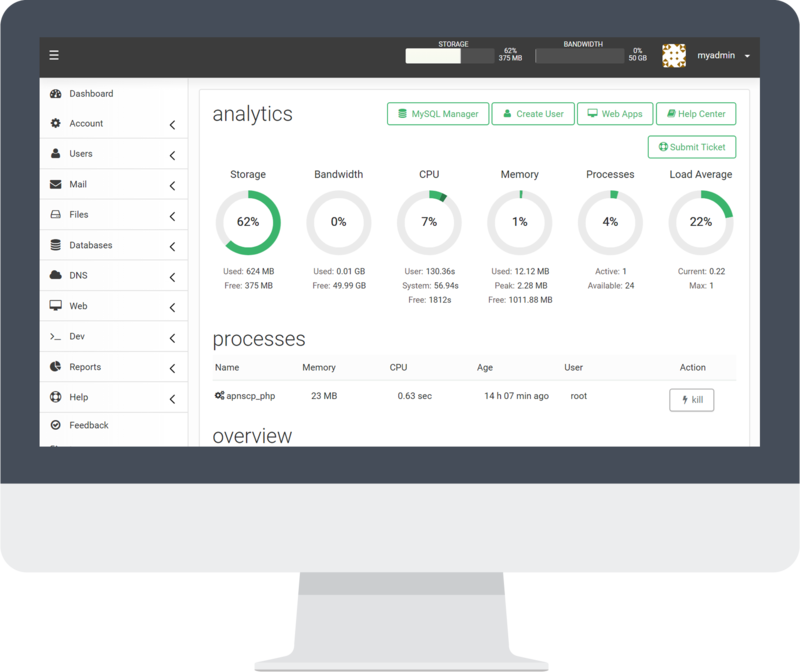 Paid support includes SLA response times as well as an emergency 1-hour turnaround with no blackouts. Support is priced per incident with 1 hour maximum time. Paid support plans are structured to keep licensing costs low, support quality high, and focus human resources on development. Support exists in absence of a good product. There is little incentive to make apnscp anything but an extraordinary product. apnscp began as the control panel for Apis Networks in 2002. 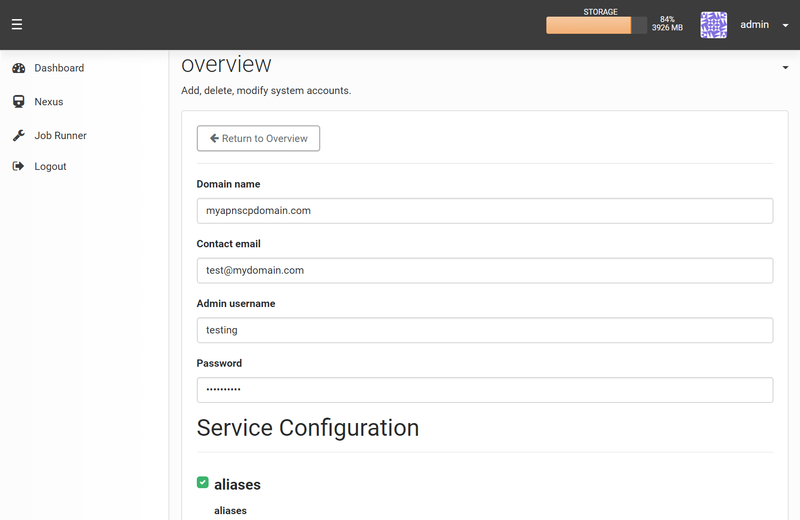 In fact, it's name Apis Networks Control Panel reflects its heritage. Over the years it's grown and achieved in large part to customer feedback through our separate hosting outfit. Today that hosting company continues to serve as an internal testing environment for apnscp. No refunds are provided. apnscp includes a 30-day free trial to evaluate the product.